Visitors were charged $10 to see the cars. The Ferrari-Maserati dealership inside the Wynn Las Vegas casino and hotel, which charged visitors $10 each just to look at the cars, closed last week after 10 years in operation. The dealership, a joint venture between Penske Automotive Group and Wynn Las Vegas, is being sold and will reopen at a new location once the deal is finalized, said Anthony Pordon, Penske's executive vice president for investor relations and corporate development. "We felt that by selling it to somebody that's in the marketplace, they could still service Las Vegas customers," Pordon said. Pordon declined to discuss the store's sales levels, noting Penske doesn't disclose the performance of individual dealerships. The Las Vegas sales volume was "irrelevant" to Penske's decision to move on, he added. Penske has two other Ferrari-Maserati stores in the U.S., in Phoenix and North Edison, N.J. It holds 178 retail franchises in the U.S. and 148 overseas. Ferrari and Maserati together generate about 2 percent of Penske's revenue. Pordon did not name the buyer of the Las Vegas dealership because the deal has not been finalized. 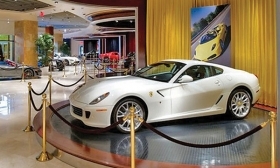 The dealership, the only Ferrari or Maserati store in Nevada, opened in 2005 as a partnership between Penske and Wynn Resorts. Located next to the hotel's main lobby, it offered tourists and serious shoppers alike the chance to peruse and maybe buy new or used Ferrari and Maserati cars -- or at least branded souvenirs at an adjacent gift shop. With 10,000 square feet of space, the location was large enough to show off some 50 cars in its showroom. Wynn spokesman Michael Weaver and Pordon said the sides mutually agreed not to renew the lease, which ends this year. "The dealership was in no way 'evicted,'" Weaver wrote in an email. "The relationship has always been, and remains, amicable." Weaver declined to say what would replace the dealership in the retail space it occupied. "We are working on something special for the space," Weaver said.